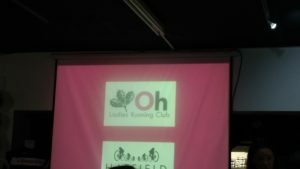 So this week our running club held an evening event, to celebrate 4 years of the club! 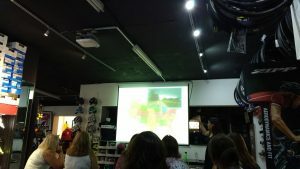 The event was being hosted in a local cycle shop (that also has a cafe- what a great idea), and they were hosting a guest speaker, Shu Pillinger. I had a bit of a rush to get there as we had a presentation to parents at work, due to finish at 6, but of course there is the tidying away and driving home. I ended up getting home at 6.55, and had the quickest ever shower and some toast before rushing out of the door at 7.20- I just made the 7.30 start in time! My phone was not keen on the screen it seems! The evening was lovely- when I arrived there were nibbles on tables as well as prosecco and sparkling water. I bought a cup of tea from the cafe (my one caffeinated drink per day allowance needed using up! ), and I chatted to a few of the club members. It’s funny seeing people out of their running gear, with normal hair! At around 7.45, we sat down and Shu began her talk, and it was just fascinating. She began by running a race for life, and from then has transformed into an ultra athlete. The main challenge she talked about was completing the RAAM (Race Across America)- she cycled the whole width of the USA in 12 days and 9 hours, and was the first British woman to ever achieve it. 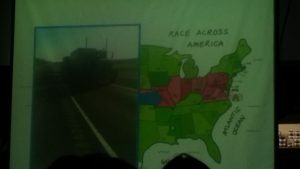 I didn’t even think you could drive across the USA in that time. She talked about the hallucinations, falling asleep on her bike while cycling (it was pretty non-stop), a bit about her vegan diet, and then her training. She commutes into London each day on her bike, 20 miles each way. One thing she mentioned was that at the weekends she likes challenges such as cycling around the outside of the M25 (not on it)- apparently to cross one of the bridges, as bikes are not allowed on it, there is a phone box and you call someone, and they turn up with a van, put your bike in the back of the van and then drive you across the bridge. It sounded like the equivalent of a secret handshake or something. She might swim a mile in the morning before that, and after the talk that evening she was running back (to St Albans, so maybe 7 miles or something, depending on whereabouts). She did a bit of a question and answer session too, and there were lots of questions about her running, different events and her weekends. Her website (linked to above) is well worth a look if you are interested in that sort of thing. It felt like a live episode of the tough girl podcast! When it finished she changed into her (marathon talk) running t-shirt and kit, and then headed off. I chatted a bit more before heading home at around 10pm. It was so inspiring and interesting, and something that I would have no idea about if the club had not put the event on. Although I am not about to cycle around Ireland or run around Cypress (other events she had taken part in) it was good to hear someone so passionate about keeping active and chasing new challenges. It was also to see some fantastic photos (Monument Valley at sunrise) and it made me want another holiday! What sort of people inspire you? What types of challenges do you like?